The National Center for Complementary and Integrative Health (NCCIH) of the National Institutes of Health (NIH)  defines complementary therapies as evidence-based health care approaches developed outside of conventional Western medicine that are used in conjunction with conventional care. Examples of complementary care include the use of acupuncture to treat migraine headache  and clinical hypnosis to improve symptoms of irritable bowel syndrome (IBS). 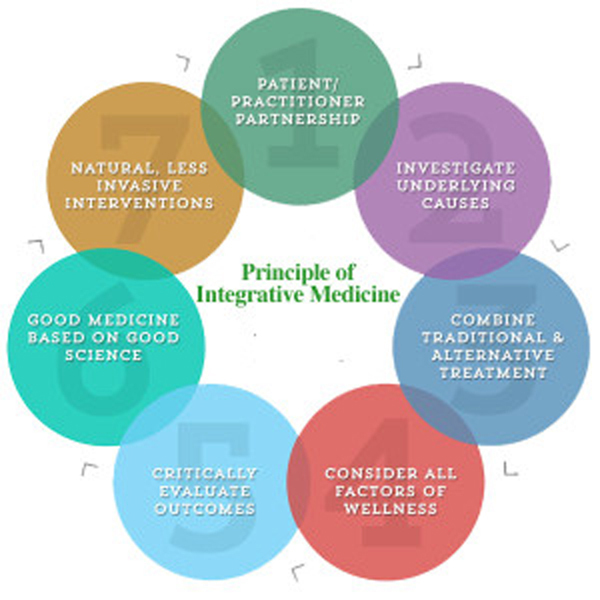 The term integrative health describes the blending of complementary and conventional therapies by the practitioner to include all appropriate therapies in a patient-centered and evidence-informed fashion. In an integrative approach, evidence-based complementary therapies may be used as primary treatments or used in combination with conventional therapies. In contrast, alternative therapies are not evidence-based, are used in place of conventional care, and are not covered in this report. Results of the 2012 National Health Interview Survey (NHIS) revealed that the prevalence of children <18 years using complementary therapies remained approximately 12% in the preceding 5 years,  reflecting the fact that more than 1 in every 10 children had used some form of complementary therapy in the preceding year. In both the 2007 and 2012 NHIS, complementary approaches were used most often for back or neck pain, head or chest cold, other musculoskeletal conditions, anxiety or stress, and attention-deficit/hyperactivity disorder (ADHD) and were more often chosen to treat a specific condition rather than to promote general well-being. Nonvitamin, nonmineral dietary supplements (eg, herbal medicines, probiotics), osteopathic or chiropractic manipulation, and yoga, tai chi, or qigong were the complementary therapies used most frequently by children in both the 2007 and 2012 NHIS. Zhang et al  conducted a study in which they used data from the Food and Drug Administration (FDA) and Infant Practices Feeding Study II of the Centers for Disease Control and Prevention, and they showed that 9% of infants, including newborn infants, received dietary botanical supplements or teas in the first year of life. To ensure consistent, quality education across the spectrum of medical education, learning competencies for physician education on integrative medicine therapies should be considered for medical school, residency, and continuing medical education activities. The Office of Alternative Medicine was established as part of the NIH by congressional mandate in 1992. In 1998, the Office of Alternative Medicine became the National Center for Complementary and Alternative Medicine, and in 2014 the name was changed to the National Center for Complementary and Integrative Health. The NCCIH has increased its fiscal-year appropriations from $50 million in 1998 to an estimated $124 million in 2014 (~0.4% of the total NIH budget). In the early years, NCCIH’s focus on research emphasized the importance of basic and clinical research as the core of building the evidence base for CAM. The NCCIH divides the various complementary therapies into 1 of 2 main subgroups: natural products or mind and body practices. Natural products include botanicals, vitamins and minerals, and probiotics as a group (also widely known as dietary supplements). Mind and body practices include acupuncture, relaxation techniques, tai chi, qigong, healing touch, hypnotherapy, and movement therapies. A third category, other complementary heath approaches, includes practices such as traditional Chinese medicine (TCM), Ayurvedic medicine, homeopathy, and naturopathy. To be comprehensive, high-quality data about both safety and effectiveness are needed. Most current safety data consist of case reports identified through passive surveillance, with little known about the true denominator of the number of people receiving the treatment and considerable concern about underreporting of the numerator. Researchers in a number of reviews of provider-delivered therapies have found reassuring evidence regarding the safety of complementary therapies. [55, 56] Although the need for rigorous safety evaluation is questioned by some who perceive “natural” as equivalent to “safe,” to support patient-centered integration of therapies, more rigorous data on safety are needed. In addition, in contrast to pharmaceuticals, there are limited requirements to demonstrate safety before marketing natural products, resulting in little motivation for detailed safety work from the manufacturer standpoint. Although consumer interest in complementary therapies continues to increase, there remains an important unmet need to develop rigorous safety data to inform policy and practice. One issue that must be considered in all research, both conventional and complementary, is the placebo effect, a sophisticated psychobiological event that operates on multiple levels of the therapeutic relationship. It has been shown to involve conditioning, learning, memory, motivation, reward, and patient expectancy on the basis of interactions with the clinician. labeled as a dietary supplement." The DSHEA also regulates third-party literature regarding dietary supplements. Informational materials (ie, articles, fact sheets) may be displayed in commercial retail sites provided they are displayed separately from the product, do not contain false or misleading information, and do not promote a specific brand of supplement. Quality and standardization of natural health products also significantly affect research, in which reproducibility of results is a critical factor. Uncertainty about the scope of practice, licensing requirements, and credentialing of complementary medicine providers are common concerns, as are concerns about patient safety and legal liability when recommending complementary therapies or therapists. Licensing information about health care professionals who are not doctors of medicine or doctors of osteopathic medicine is maintained by state licensing boards and shows significant state-to-state variation. As with physicians, regulations, licenses, or certificates do not guarantee safe, effective treatment from any provider. Local and state governments and professional organizations generally establish the credentials that complementary health providers need to treat patients. If a complementary medicine practitioner is licensed, then he or she must also practice within his or her scope of practice as defined by local and state statutes and regulatory boards. Life-threatening Conditions Pediatricians also need to be aware of alternative therapies that may be used as a substitute for conventional medical care for children with life-threatening conditions and decide whether they believe such treatment is reportable under state abuse and neglect laws. Another legal duty of pediatricians relates to the assurance that seeking reimbursement for complementary therapy does not trigger a potential violation of fraud and abuse laws for therapy deemed “medically unnecessary.” Ultimately, it is prudent to be cautious about any representations or guarantees. In certain circumstances, charging patients directly for services may violate medical insurance or system contracts; therefore, individual primary care providers should apprise themselves of rules and regulations relevant to their specific practice model. The 2001 AAP Policy Statement, “Counseling Families Who Choose Complementary and Alternative Medicine for Their Child With Chronic Illness or Disability,” was reaffirmed in 2010 and continues to recommend that pediatricians seek information, evaluate the scientific merits of specific therapeutic approaches, and identify risks or potential harmful effects. Pediatricians may want to be familiar with the complementary medicine providers in their area so that they are able to advise patients on providers who are appropriately working within their scope of practice. Similarly, pediatricians are encouraged to advise parents and patients about the importance of establishing the safety and quality of any product sold in a complementary medicine provider’s office or in any commercial venue. The level of evidence required for evaluating efficacy can be small when there is little to no risk of harm from a therapy, especially when other therapies are likely to be futile. Likewise, the level of evidence for efficacy required to endorse a particular complementary therapy would be quite high when that therapy is risky and when safer, more effective therapies are available. Situation-specific variables can also affect ethical decision-making. For example, the patient’s and parents’ personal beliefs, cultural values and practices, and therapeutic goals; the type and severity of illness; and the lack of efficacy and safety data in a specific patient can affect the decision to use complementary therapy. Even when such data are known for other populations, application of population data to individual pediatric patients requires inference and implies some degree of uncertainty. The tolerance of the patient, family, and primary care provider for uncertainty varies from one situation to another. As experts in assessing safety and efficacy, pediatricians’ input into treatment decisions is critical in enabling families to make the best evidence-based decisions regarding these therapies. Informed consent for any proposed treatment includes a discussion of the risks, benefits, and reasonable alternatives. Failure to discuss reasonable alternatives can create legal risk for a physician. Although courts have not yet ruled that failure to offer reasonable complementary medicine alternatives is actionable, the potential for liability exists. Children should be allowed to participate in their care and decision-making in a manner that is appropriate and specified by state law; most states have very specific laws regarding age for assent for treatment. Despite high demand for integrative care,  a lack of systematic education about the safety and effectiveness of complementary and integrative therapies in pediatrics still exists. One example of educational initiatives underway in pediatric integrative medicine to fill this gap is the Pediatric Integrative Medicine in Residency program, a 100-hour online educational curriculum that was implemented as a pilot in 5 pediatric residency training programs in the United States, and in 2016 it reached >500 residents nationally and internationally. Osteopathic physicians receive extensive training in integrative medicine with regard to osteopathic principles and osteopathic manipulative treatment (OMT). What follows is an overview of each of these categories with resources for further reading, rather than an exhaustive review of individual therapies. The level of evidence evaluating the use of these therapies varies greatly. For some interventions, there are numerous high-quality investigations, but for others the data are sparser. It is important for individuals to weigh the best available evidence and risk/benefit ratio for any intervention used in children, either conventional or complementary. The NCCIH designates natural products to include dietary supplements, herbal or botanical products, traditional medicine formulations, folk medicine, homeopathic remedies, probiotics, and food-based phytochemicals.51 It may be most important for the pediatrician to recognize that thousands of natural health products exist, many are routinely marketed to children and adolescents, hundreds of studies have been published in this area, good sources of synthesized information exist, and consistent caution is needed in assessing quality of natural health products and their potential for adverse interactions with prescription or over-the-counter medications. Natural Medicines (formerly Natural Standard and Natural Medicines Comprehensive Database) ; and ConsumerLab.com. Melatonin Melatonin is another commonly cited dietary supplement in the NHIS in children. Melatonin is primarily produced by the pineal gland and is closely regulated by the suprachiasmatic nucleus, which regulates the sleep-wake cycle. Melatonin is used for functional sleep disorders to decrease sleep latency and in some children with neurodevelopmental disorders who have associated sleep disturbances. [92–94] Despite wide use, long-term studies on the safety and efficacy of pediatric melatonin use are lacking. Well-designed RCTs are expanding the evidence on natural products in a variety of other pediatric conditions, including the following: pain, headaches, ADHD, asthma, atopic disease, and colic,  among others. The use of diets with what have been termed “functional foods” is an evolving research topic in pediatrics. One familiar example is the ketogenic diet, used for children with refractory and severe epilepsy, which has shown benefit in seizure control in some children comparable to antiepileptic drugs. Elimination diets have been studied in IBS,  gastrointestinal food sensitivities or allergies,  atopic disease,  ADHD,  autism spectrum disorders,  and migraines. A common concern about each of these types of diets are the risks of macro and micronutrient deficiencies. A newer area of nutrition research in pediatrics is the use of the balanced Mediterranean diet pattern as a preventive tool in childhood obesity and its associated comorbidities, such as cardiovascular disease and metabolic syndrome. A protective effect of the Mediterranean diet has also been noted against asthma, rhinitis, and eczema in certain pediatric populations. [122–124] Larger-scale studies are needed, including assessment of long-term outcomes of various diets in children. The most commonly used manipulative, movement, and body-based practices in pediatrics include osteopathic manipulation, chiropractic, and massage.1 According to the most recent NHIS, 3.3% of US children (1.9 million) used chiropractic or osteopathic spinal manipulation in 2012. [12, 125] Yoga is a popular movement therapy also widely considered a mind-body–based practice11 and is discussed under the Mind-Body Therapies section of this report. Research on manipulative, movement, and body-based practices in children or adolescents is limited and available mostly for osteopathic manipulation, chiropractic, and massage. The studies primarily consist of case reports or small series with only a handful of small RCTs. A brief overview of the modalities follows. Osteopathic medicine, practiced by those who have earned Doctor of Osteopathic Medicine (DO) degrees, emphasizes preventative medicine and holistic care. In addition, OMT, a form of manual manipulation, is taught to all osteopathic medical students, emphasizing the importance of maintaining healthy muscle and lymphatic balance. DOs incorporate OMT to varying degrees in clinical practice, although it has been established that many DOs do not use OMT regularly in their care of patients. Historically, osteopathic medicine has emerged as a separate discipline but has been accepted as an effective treatment modality in today’s health care climate in the United States. [128, 129] Although a small community of DOs maintains that osteopathy is a distinct discipline,  most consider OMT to be conventional therapy. The AAP Section on Osteopathic Pediatricians serves as an important resource for further education and evidence-based study in osteopathic medicine and provides an overview of evidence-based research. Safety and Adverse Events Serious complications are possible with chiropractic treatment of children, but such adverse effects are rare and related to high-velocity, extension, and rotational spinal manipulation. [56, 131] It is essential that any known preexisting underlying pathology be discussed and an age-appropriate, thorough history and physical examination be conducted to exclude abnormal anatomic or neurologic findings before any type of manual or manipulative therapy is used on a child or adolescent.132 Prospective population-based active surveillance is recommended to accurately assess the rates of adverse events related to manual and manipulative therapies in children. Studies are ongoing. Massage has also been shown to increase weight gain in term infants  and has a beneficial effect on symptoms of colic,  pain in hospitalized children,  ADHD,  and depression. [137, 140] Although massage can be a beneficial adjunctive therapy in some childhood conditions mentioned previously, further studies are needed on the effectiveness of massage on many other childhood conditions. Prenatal yoga has also been shown to reduce maternal anxiety and depression, according to a systematic review,  and to improve birth weight, decrease preterm labor, and reduce the risk of intrauterine growth restriction. [153, 154] More systematic studies are needed on the effects of prenatal yoga and yoga in other health conditions in children. Mind-body medicine is a rapidly growing area of research in children that shows low risk of adverse events. The 2016 AAP Clinical Report on the use of mind-body therapies in children provides a detailed overview of the current research in this area. Potential concerns associated with the use of mind-body therapies may include delays in diagnosis or treatment of serious illness or use in a child with a history of trauma or who suffers posttraumatic stress disorder. Open discussion of all therapeutic approaches is important so that parents feel safe and supported in bringing their questions on the use of complementary therapies to conventionally trained health care providers. Additional studies are needed to evaluate safety and effectiveness of individual and combination mind and body therapies for specific medical conditions and overall well-being. In a 2011 systematic review of reported adverse events associated with pediatric acupuncture, Adams et al  concluded that acupuncture is generally safe in the pediatric population when practiced by an appropriately trained practitioner. The body of literature on the efficacy of acupuncture in specific conditions is accruing, although interpretation is hampered by study size and design variability. In a review of 24 systematic reviews involving 142 RCTs and >12,000 children, Yang et al  showed there is promise for the use of acupuncture in pediatric pain, nocturnal enuresis, tic disorders, amblyopia, and cerebral palsy, with few adverse events reported. In a review of the literature in a 2016 paper, Brittner et al  reflected a similar variability in study design and quality, with the strongest evidence seen in the treatment of pediatric headache and migraine and in treatment of postoperative pain. Whole medical systems involve complete systems of theory, diagnosis, and practice that have evolved independently from or parallel to conventional Western medicine. The most commonly recognized whole medical systems include TCM, Ayurvedic medicine (India’s traditional system of medicine), and naturopathy. Each generally relies on the use of a detailed diagnostic process and uses highly individualized treatment protocols that may involve diet and exercise, along with herbal treatment, making them more challenging to evaluate, especially in pediatrics. Ayurveda Ayurvedic medicine is one of the oldest whole medical systems in the world and is widely used in India and South Asia. The word Ayurveda means “the knowledge of life” and comes from the Sanskrit words “ayur” (life) and “veda” (science, knowledge). Ayurvedic medicine concepts include universal interconnectedness (people, health, universe), the body’s constitution (prakriti), and life forces (dosha). Ayurvedic physicians prescribe individualized treatments, including diet, herbs, spices, exercise, and lifestyle. Similar to herbs used in TCM, Ayurvedic herbal medicines can have both powerful therapeutic and toxic effects and may expose patients to heavy metals, especially lead, mercury, and arsenic. [168, 177–179] Ayurvedic approaches have been studied in children for treatment of certain conditions (for example, iron-deficiency anemia). Curcumin is valued in Ayurvedic medicine for its antiinflammatory properties and has been evaluated for safety and tolerability in children with IBS. Further studies on its specific clinical application and dosing in pediatric conditions are needed. A 2012 Cochrane Systematic Database review commented that curcumin may be safe and effective as an adjunct treatment in the maintenance of remission in ulcerative colitis. Further studies are needed to determine the efficacy and safety of Ayurvedic treatment modalities in pediatrics. Naturopathy Naturopathy is guided by a philosophy that emphasizes the healing power of nature. Naturopaths use both traditional and modern therapies (approaches they consider to be the most natural and least invasive) and view their role as supporting the body’s inherent ability to maintain and restore health. [172, 181] There is currently little evidence on the use of naturopathy in medical conditions in children. Pediatricians and other primary care providers who care for children are encouraged to advise and counsel patients and families about relevant, safe, effective, and age-appropriate health services and therapies, regardless of whether they are considered conventional or complementary therapies. In the 2001 AAP Periodic Survey of Fellows, 73% of pediatricians agreed that it is the role of pediatricians to provide patients and/or families with information about all potential treatment options for the patient’s condition, and 54% agreed that pediatricians should consider the use of all potential therapies, not just those of mainstream medicine, when treating patients. Because most families use complementary and integrative health services without spontaneously reporting this use to their primary care provider, pediatricians can best provide appropriate advice and counseling if they regularly inquire about all the therapies the family is using to help the child. Pediatricians should seek continued and updated knowledge about therapeutic options available to their patients (whether they are mainstream or complementary) and about the specific services used by individual patients to promote discussion about the safety, appropriateness, and advisability of complementary therapies. Only then can pediatricians appreciate the concerns of their patients and families and offer them the thoughtful and knowledgeable guidance they may require. Given accruing supporting evidence and the potential of integrative approaches to improve preventive care in children, policy and health insurance coverage should evolve accordingly to provide fair coverage for patients and equitable payment for physicians. The NCCIH provides a toolkit  with materials to help both patients and providers talk about the use of complementary health practices. The following practical tips will help health care providers feel “ARMED” to address the topic of complementary approaches with more confidence and ease. D: Distribute evidence-based information about relevant therapies available from the NCCIH, the ACIMH member institutions, and an increasing number of publications in peer-reviewed journals and professional review articles. We thank Kathleen Kennedy for administrative support.